Recently, we posted a new Beaded Christmas Wreath to the web site. We prefer to purchase beads in bulk, either the same bead type and size in multiple colors or an overall mix of beads. But, how do you organize and store them? For an inexpensive and efficient solution, we like to use plastic zip top snack and sandwich bags. Yes, you can purchase those plastic bead organizers, but for ease of use and more compact storage, zip top bags work great. Plus, if you buy the store brand, those zip top bags are much cheaper. It’s also easy to store the individual bags in a gallon storage bag. The clear bags make it easy to see the variety of beads, and if you press out the air before you seal the bags, the smallest amount of space will be used (…similar to those plastic closet storage bags you see advertised frequently). Beads add embellishment to a variety of crafts. You can separate them by color, by color and type, or by color, type and size. Once separated, it’s easy to find that perfect embellishment you need for your current project. Several family members will be receiving the Beaded Christmas Wreath as gifts this Christmas to add sparkle and shine to this and future Christmas celebrations. Each will receive a variety of the wreaths in their favorite colors from lime green to pink to purple to blue. Having the beads organized – some by color and some by color and type, makes it easy to determine the alternatives for each wreath for each person. Yes, it can be tedious to separate thousands of inexpensive beads, but the organization prevents the frustration of trying to figure out if you have enough of the right color and type of beads (for example, lime green – a difficult color) to make the project. Plus, if you’re making several (in this case, six for each person) ornaments, having the beads organized helps you determine the available options to make each ornament unique. As you organize, several bowls or glasses make the initial separation easier. Once you have the beads separated, place them in the right size zip top container. When finished, the bowls and glasses go back to their regular purpose. This organization technique helps with sequins and buttons too. Added – just today – how to make simple and elegant Beaded Christmas Wreath ornaments. These ornaments use inexpensive materials, common tools and a small amount of time to make. Though small, these ornaments add beauty to any tree – large or small. The materials can easily be found at the big box discount stores or at craft supply stores. The beads in bags of 500 pieces or higher cost just a few dollars (<$5). The fuzzy fiber wire comes in packets of 25 or more for less than $1. Each wire is long enough for two ornaments. Or, if you have it on hand, you can use bead wire or floral wire. For the decorative ribbon, craft ribbon or gift ribbon work great. Several yards come on a spool for less than $2. The lace is optional and can be purchased in bulk as well for a few dollars. For the hanging loop, a small packet of yarn can be found for a small amount of money. Or, if you prefer, you can leave the yarn loop off the ornament. You can also use thread or string for the hanging loop. For less than $10, you can make between 30 and 50 ornaments. They’re pretty and look more expensive than they are. Their “expense” can be found in the care and attention you took in making them. These simple but elegant ornaments show people you care. Depending on how close you are to the people on your list, you can give one or several of the ornaments to each person. Just think, Christmas should be about giving from the heart. Giving people something you made with thoughtfulness and attention shows them you care about them and about the spirit of the holiday. It’s that time of year in the south. Lots of craft shows pop up in the towns and smaller cities. Plus, churches and schools host bazaars and crafts. A friend and I went to two craft shows over the weekend. One was in a small town in southern Tennessee. The show was small, but this also happened to be the first one they’ve held. There were interesting products in the small number of booths. My friend found two quilts she liked and bought. One was a yellow puzzle pattern with various blue paisley fabrics pieced among the puzzle and around the border. The other was a vibrant geometric pattern in reds, yellows with a black accent. Both were very striking and worth the price. The second craft show located in a suburb of Atlanta included lots of booths with a variety of products – soaps, candles, woodworking, textiles, photos, paintings, jewelry (lots of jewelry) and other varieties of goods. Craft shows are wonderful places to get ideas. Of course, you don’t want to copy someone else’s creativity; however their ideas can spark your interest and give you new ideas with your own flair. In the meantime, funEZcrafts bought some crafts and took notes about other crafts that generated different ideas. We will be posting some new how-tos on the web site in the near future. Enjoy craft shows in your own backyard. Buying their products supports local crafts people. The best part about craft shows, though, continues to be the ideas you get for your own crafting fun. In today’s economic times, saving money can be a necessity. Sometimes it can be fun just to see how much you can save without being fanatical. Wet areas, such as showers, are prone to mildew in addition to soap scum and dirt. Yes, you can purchase shower sprays to get rid of the mildew. However, you can easily make your own with simple ingredients – four parts water to one part chlorine bleach. Now, if mildew has taken over your shower, use a stronger bleach mixture. Just be careful about getting the mixture on your skin. The bleach will dry out your skin quickly not to mention smell bad. Place the mixture in a spray bottle clearly marked as bleach and water. Use on your shower to clean then prevent the mold and mildew. Of course, NEVER mix bleach with ammonia. Fumes from the resulting mixture can be deadly. It’s been awhile since the last post, but we’ve been busy working on our Christmas e-books. Here’s Sidney Camel…isn’t he great? He’s just a sweetheart, alert and eager to please. Wouldn’t he look great in your decorations? Or, he could be a keepsake ornament to give to family and friends this holiday season. Handmade gifts come from the heart. Wouldn’t you like to give heartfelt gifts this year? Do you frequently use credit, debit or membership cards with a magnetic strip on the back? Have you had to replace one (or more) because the magnetic strip no longer worked? Maybe the data strip became scratched as it rubbed against other things in your purse or wallet. Years ago, banks provided sleeves for ATM cards to protect the magnetic strip. These sleeves were made out of a Tyvek-like material. The holder made the card last much longer. Our Easy Felt Crafts – Business Card Holder or our Easy Felt Crafts – Small Items Pocket can be used to protect your cards and prevent the magnetic strips from being scratched. Both small pouches are made of inexpensive craft felt which is not only easy to use but is also soft to protect the magnetic strips of your cards. The instructions and patterns can be found on our website. Have you looked at our Easy Paper Crafts – Faux Stained Glass yet? Here’s another application – similar, yet slightly different. 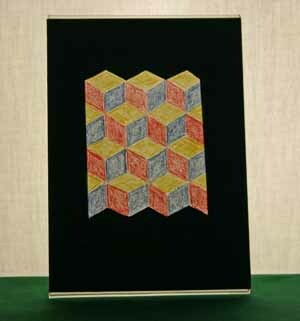 How about using quilt block patterns to make your stained glass pattern. Here’s a version of the baby block pattern used for the faux stained glass. Instead of crayons, this faux stained glass uses coloring pencils on tracing paper. The pencils color more consistently, and the tracing paper allows for the transparency. With a compass and a ruler, you can make your own baby block pattern and size the blocks however you want. As you can see, the pattern repeats and gives the impression of three dimensional blocks stacked on each other. The size shown here fits into a 5 x 7 frame. The backlighting shows the colors of the faux stained glass. A green construction paper surrounds the pattern with the zig-zag of the top and bottom baby block pattern cut into its border. Determine the size you want your faux stained glass to be and add more of the blocks as needed. Our goals for the blog includes both crafting tips and hints and also household hints. After spending some weekend time cleaning, here’s a dusting tip. Great dusting products exist on the market today. Some use electro-static cling in addition to their material composition. Others use an oil and chemical mix that you use on your own cleaning cloth to clean, dust and protect at the same time. Neither of these types of cleaning products solve the problem of dusting tiny crevices, scrollwork or barnboard that can be found in picture frames or in electronics. One simple but handy tool can help solve the problem and should be added to your cleaning tools collection. This trim brush is one inch wide, made of soft but sturdy bristles and has a long handle. It has seen a lot of painting – and with a simple wash could still be used as a paintbrush; however, it works great for cleaning those difficult to dust items. The narrow width and long handle make the tool easy to use and useful. If you have any pictures framed with a rough material – like barnboard – or any ornate scrollwork, the brush easily gets into the areas to clean. It effortlessly cleans the speaker area of clock radios and the filter area of blow dryers too. Dry dust the object first, then if more cleaning is needed, add a spritz of cleaning spray or furniture polish to the brush and dust again. You’ll find other cleaning uses for the simple but handy paintbrush! We want to add tips and hints to our blog for using the projects on our web site and for other crafting ideas and solving problems around the home. 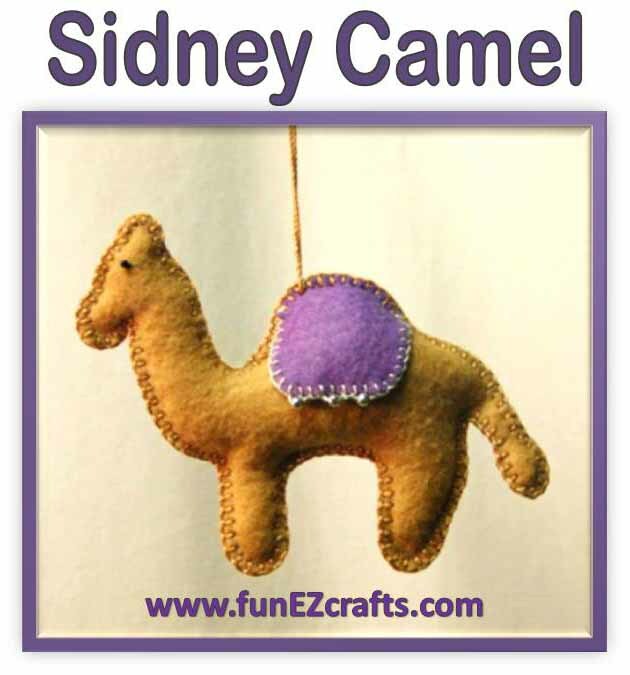 Take a look at our funEZcrafts web site for fun and easy craft ideas using simple materials and tools. We strive to provide inexpensive ideas that are fun but can be profitable too. Author adminPosted on July 1, 2009 September 11, 2009 Categories CraftsTags Welcome!